The investigators will look over this lyric, from a little known song by a local pianist and poet, but not for long. Over the next year, this particular song will be linked to up to seventeen more suicides, enough to give it the name “the suicide song”, as well as worldwide recognition as one of the saddest songs ever written. The rest of the world was still feeling the aftershocks of the Great Depression. Grain prices plummeted, and grain was where Hungary made most of their money. With their chief export bringing in little to no money, their newly restored economic infrastructure collapsed. By 1933 one out of every five people living in the city of Budapest was in poverty, and the unemployment rate for the country was at an all-time high of 36%. With no help coming from the League of Nations (sounds like a superhero group, doesn’t it? ), the only thing Hungarians could do was live off their land, and try not to starve to death. Everyone was balancing on the edge of life and death, and the slightest nudge could send them toppling down. 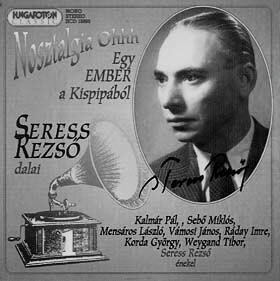 Rezso Seress lived most of his live in poverty, in Budapest, like everyone else. He was a failing pianist and songwriter who frequently played at the Kispipa restaurant, known for its single pipe stove, unbearable cold, and a seedy clientele of prostitutes and bohemian spirits. 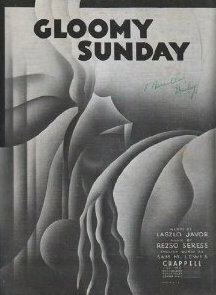 It was in this restaurant that Seress began working on “Gloomy Sunday.” Seress had a strong love for his country, and his country was screaming out in pain. To him it was like watching a loved one dieing in his arms. The economic crash and political strife filled him with despair. He let this despair fuel him as he wrote, but his lyrics were lacking. He went to a friend, and poet, Laszlo Javor, who helped him develop the lyrics into a story of a man asking his dead lover to attend his funeral, having killed himself because she’s dead. I honestly can’t think of a sadder concept than that. Once they finished the song, Seres found it difficult to get published. One such publisher had stated “It’s not that the song is sad; there is a sort of terrible compelling despair about it. I don’t think it would do anyone any good to hear a song like that.” However, after some time, Seress was able to get his song published. Within a week it became a best seller, and Seress took his first step on a road of fatal fame that would eventually destroy him. When asked about it, he would say, “I stand in the midst of this deadly success as an accused man. I cried all of my disappointments of my heart into this song, and it seems that others with feelings like mine have found their own hurt in it”. Indeed, they had found their hurt. They cradled it, and in their moment of weakness, took their lives. It began with Joseph Keller, but extended outward, with a total of 18 cases in which the song was directly involved. A girl was dragged from the Danube with the sheet music clutched in her frozen fingers. Another woman overdoses on barbiturates and was found with the song playing over and over on her phonograph. A man asked for it to be played repeatedly at a bar, and afterwards he went home and shot himself dead. Beyond this number, there are many other claims of suicide, upwards of one hundred, though the evidence is much more circumstantial. While the song became popular outside of Hungary, with covers done by many famous performers of the time, including Billie Holiday and Louis Armstrong, no other large increase of suicides was ever recorded outside the country of the song’s origin. In my last article I asked that you listen to the song and tell me what you think. For this one I ask that you don’t. While I do not think you will end it all, it is very sad, and I am here to inform and fascinate, not to depress.The song itself, without the words, is incredibly sad. The song is written in C-minor, and it never deviates. Not a single major chord is played, and it sits on you like a weight, pushing you down. 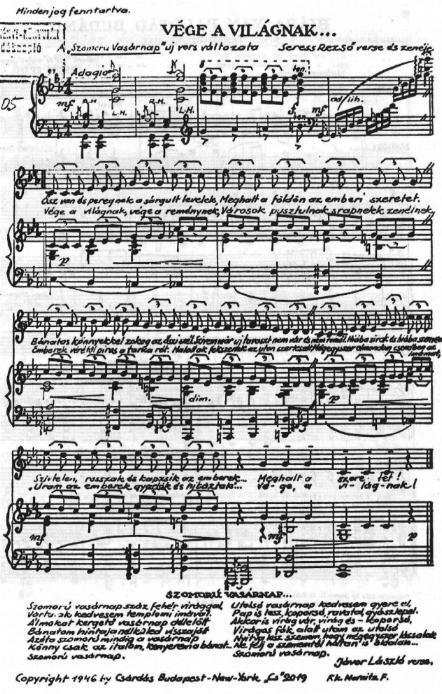 The lyrics are painful, even though I have read that they are much more sad in the native Hungarian. The whole song is a tremendous downer. I even find myself not wanting to write anymore, but I know that it’s just my brain acting on the sound. Just as there is a place in the brain that activates when it hears things that it enjoys (called the orbitofrontal cortex), there is also its counterpart (the posterior cingulate cortex), which is responsible for that feeling in our gut that we get when we’re so sad, it hurts. It fires up when you experience emotional pain, conflict, and social rejection. Music can also activate it, which has led many musical theorists and neuroscientists to believe that there is a strong link between emotion and tonality. Many tones in music can seem like a characterization of some of the tones in human speech, which can indicate emotional content. It makes sense that an entire country, surrounded by such strife, would have their posterior cingulate cortex firing on all cylinders. In times like these, a strong negative emotional stimulus can cause a breakdown, and even lead to suicide. When Marilyn Monroe decided to take her own life in 1962, researchers noted a spike in suicides, with an extra 330 cases that year. Hungary is also the country with one of the highest suicide rates—it almost seems programmed into their culture. Whether or not the song is to blame for these deaths, it is still fascinating and deeply terrifying that the possibility is there. That a musician’s words could spark such sadness as to cause people to take their lives leaves me worrisome, and fearful. It ended for Seress the same way it started: sad and alone, in poverty in Budapest. He survived World War II, the holocaust, and his only big hit was “Gloomy Sunday,” famously known as “the suicide anthem.” The worst part is that he had amassed a great fortune in royalties, but the money was in a bank in the United States, and by now, Hungary was darkened by the shadow of the Iron Curtain, which blocked the western world from much of Europe. 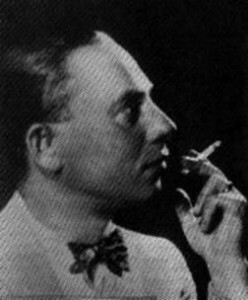 With no way for Seress to leave the now Soviet nation or Hungary, and with his fortune stagnating in the United States, he took his life. At age 68, he stood on the windowsill of his tenement in Budapest, no doubt reflecting on his sad life and unwanted fame, and now with the lives of the people he may have inadvertently taken throwing him even deeper into despair. It was January in Budapest, and there was once again a sheen of ice across the Danube. A fresh dusting of snow covered the world in white, giving a shimmery, ghost-like appearance to a man who lies on the pavement, unmoving. Some interesting covers on the song too—even Bjork got a hold of it! But most importantly, this was excellently written. For a story that I’m sure can be found in a bunch of places, you really manage to make it your own. Your opening and closing imagery is really what brings it to life. I can honestly say I was fascinated throughout—and for awhile there, even felt like a grief-stricken Hungarian. Now if you can do THAT as a writer, you’re made in the shade.